Think smartphones are just a fad? You might want to consult with military snipers in Afghanistan who use a $19 iPhone app to help their bullets hit home. When you think about it, sniping is actually a hell of a lot more complicated than it is in, say, Team Fortress 2, where it's essentially "point crosshairs and shoot." In real life, there are tons of factors that can affect where exactly your bullet ends up once it leaves the barrel of the gun: ballistics, wind velocity - even something like the rotation of the Earth itself. That's part of the reason that military sharpshooters get special training, of course... but to make it even easier on snipers currently at work battling terrorists in Afghanistan, there's an iPhone app for that sort of thing. 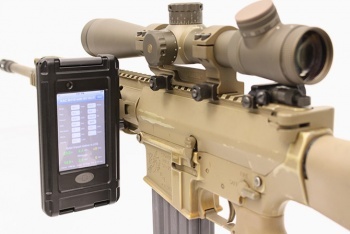 BulletFlight, a program for the iPod Touch and iPhone, helps work out the ballistics of any given shot, taking into account the wind and rotation of the Earth - and even predicting the wounds that the target will suffer if the bullet finds its mark. Though given the power of most modern sniper rifles, I'd be very surprised if the program didn't just default to "acute case of death." BulletFlight, is one of many apps officially endorsed by the US military for use in Iraq and Afghanistan - others include "maps, survival books and tactics guides." It does make one wonder, though ... this sounds like an incredibly convenient program to have, and I can understand why snipers and sharpshooters would want to take advantage of it. But if it's so useful, why wouldn't the military just requisition a portable stripped-down device that's built to just run this program instead of requiring all their sharpshooters to buy iPhones? Eh, politics. BulletFlight can be downloaded by anybody for just $19, though if you aren't actually in the military be prepared to get some very strange looks. And please stay out of line of sight of me at all times.